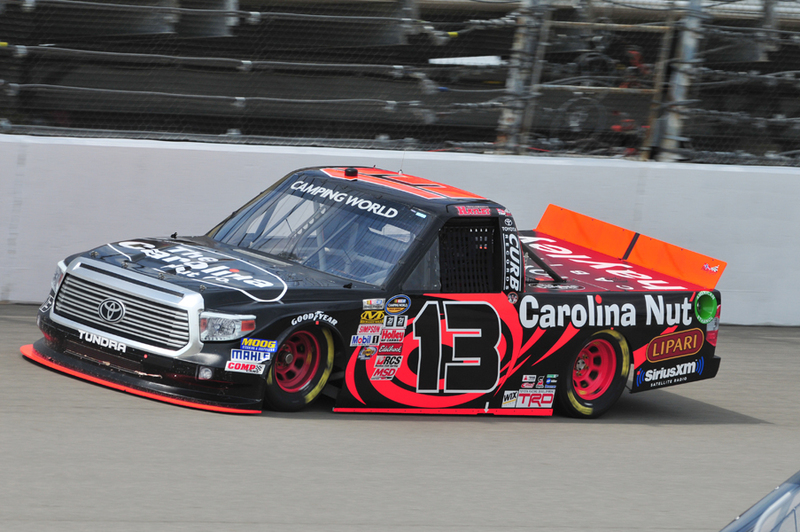 Sandusky, OH (August 17, 2015) - Coming off his seventh top-10 finish of the 2015 NASCAR Camping World Truck Series (NCWTS) season at Michigan International Speedway in Brooklyn, Cameron Hayley, driver of the No. 13 Carolina Nut Co. Toyota Tundra, is anxious to get back to his short track racing roots. Making a quick turn around in racing action, the Sunoco Rookie of the Year contender heads to the 0.533-mile concrete oval of Bristol Motor Speedway (BMS) for Wednesday night's UNOH 200 looking to capture his first NCWTS win, a feat that has only been done twice in series history by Joe Ruttman (1995) and Rick Carelli (1996). While this is Hayley's 12th different track debut on the 2015 NCWTS schedule, the Canada-native has one previous start at "Thunder Valley" in the K&N Pro Series East, earning a top-10 qualifying effort, and a 17th-place finish. Hoping to use his prior laps around BMS to his advantage, Hayley is confident in the Toyota Tundra that his ThorSport Racing team has prepared for Wednesday's 200-lap event. "I can't wait to finally get back to another short track. I've raced at Bristol Motor Speedway once before, in a K&N Pro Series East, so I have a little bit of track experience heading into this race. I think we have a great Toyota Tundra prepared, and hopefully we can get a top-five finish with it, or even a win. We've had some solid runs lately, and I can't wait to get another one at Bristol." Chassis Chatter... The No. 13 ThorSport Racing team will utilize chassis No. 49 for Wednesday's UNOH 200 at Bristol Motor Speedway. This particular chassis has been raced twice already this season at Martinsville (Va.) Speedway, finishing 11th, and Gateway Motorsports Park in St. Louis, where Hayley finished fifth. Bristol Bulletin... Hayley will make his 12th NCWTS track debut of the 2015 season at BMS on Wednesday. However, the NASCAR Next Alumni has one previous start at BMS in the K&N Pro Series East in 2014. Hayley qualified seventh and finished 17th. The only two tracks the rookie has previously raced at before this season is Dover (Del.) International Speedway and Texas Motor Speedway. Season Review... After 13 races this season, Hayley has completed 1870 of 1989 laps attempted (94%) and led 41 laps en route to three top-five and seven top-10 finishes. Rookie Race... Hayley is currently second in the 2015 Sunoco Rookie of the Year battle behind leader, Erik Jones, after 13 races this season. Previous Race Recap... Laying down sporty laps throughout both of Friday's practice sessions at MIS, Hayley was ranked in the top-three fastest drivers heading into Saturday's qualifying for the Careers for Veterans 200. Advancing his way into the final round of qualifying at the two-mile D-shaped oval, the rookie posted a lap good enough for the sixth starting position. Fighting within the lead pack for the entire 100-lap event, Hayley struggled with the handling of his Toyota Tundra swinging from tight to loose. However, a string of late race cautions allowed the Sunoco Rookie of the Year contender to make his way up through the pack, and capture a top-10 finish in his MIS debut. Brooklyn, MI (August 15, 2015) - Cameron Hayley, driver of the No. 13 Carolina Nut Co. Toyota Tundra, made his track debut in Saturday's Careers for Veterans 200 at Michigan International Speedway (MIS) in Brooklyn. Starting sixth, the Sunoco Rookie of the Year contender finished 10th, his seventh top-10 finish in 13 starts this season. Sandusky, Ohio (August 11, 2015) - Coming off a career-best finish of fourth at Pocono (Pa.) Raceway, Sunoco Rookie of the Year contender, Cameron Hayley enters the 13th NASCAR Camping World Truck Series (NCWTS) race of the season at Michigan International Speedway (MIS) in Ann Arbor with confidence. Not only did Hayley capture his third top-five finish of the 2015 NCWTS season at Pocono earlier this month, the ThorSport Racing driver did it competing against a field plagued with NASCAR Sprint Cup Series regulars, including Kyle Busch, and former series champions, Kevin Harvick and Brad Keselowski. Chassis Chatter... The No. 13 ThorSport Racing team will utilize chassis No. 41 for Saturday's Careers for Veterans 200 at Michigan International Speedway. Thisparticular chassis has been raced twice already this season at Kansas Speedway in Kansas City, KS, finishing fifth, and Texas Motor Speedway in Fort Worth, where Hayley finished seventh. Michigan Minute... Hayley will make his 11th track debut of the 2015 NCWTS season at MIS on Saturday. The only two tracks the rookie has raced at this season is Dover (Del.) International Speedway and Texas Motor Speedway. 2015 Season Review... After 12 races this season, Hayley has completed 1770 of 1889 laps attempted (93.7%) and led 41 laps en route to three top-five and six top-10 finishes. Rookie Race... Hayley is currently second in the 2015 Sunoco Rookie of the Year battle behind leader, Erik Jones, after 12 races this season. Previous Race Recap... Hayley started 16th and finished a career-best third in his track debut at Pocono (Pa.) Raceway. The NASCAR Next Alum's finish was even more impressive than a typical result considering four NASCAR Sprint Cup Series regulars competed in the race, including past NASCAR Sprint Cup Series champions, Kevin Harvick, and Brad Keselowski. Long Pond, PA. (August 1, 2015) – Making his 10th different track debut in 12 races in his first full season in the NASCAR Camping World Truck Series (NCWTS), Sunoco Rookie of the Year contender Cameron Hayley marked the halfway point of the 2015 season with a career-best finish of fourth in the Pocono Mountains 150 on Saturday afternoon. Sandusky, Ohio (July 28, 2015) - Cameron Hayley, driver of the No. 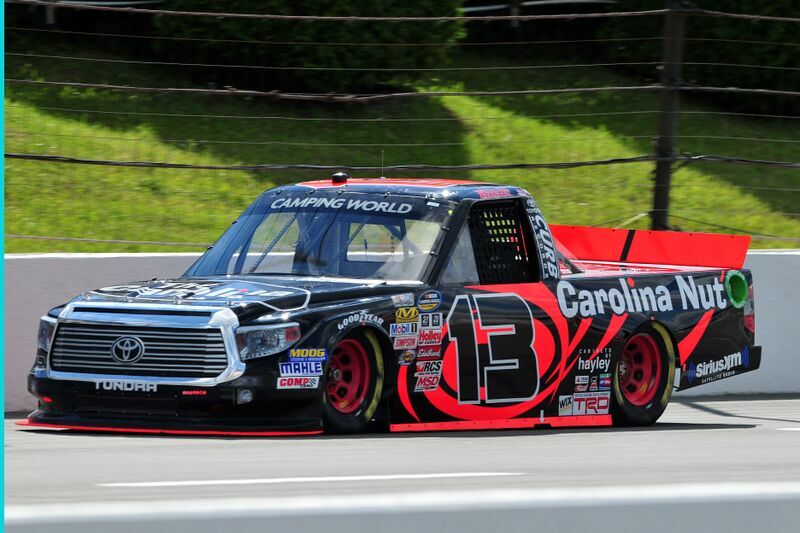 13 Carolina Nut Co. Toyota Tundra, will make his 10th track debut of the 2015 NASCAR Camping World Truck Series (NCWTS) season in Saturday afternoon's Pocono Mountains 150 at Pocono (Pa.) Raceway. Hayley, who is currently sixth in the 2015 NCWTS driver point standings, is coming off his fifth top-10 finish of the season at Eldora Speedway in Rossburg, Ohio. Saturday's 60-lap/150-mile race at the 2.5-mile Pocono Raceway ties Daytona International Speedway as the largest oval track the Sunoco Rookie of the Year contender has seen in his young career. Saturday's Pocono Mountains 150 marks the sixth time the series has visited the "Tricky Triangle" since 2010. In five races at the Long Pond, Pa. track there have been five different winners, including first-time NCWTS winner, Joey Coulter (2012). Hayley looks to add his name to an already impressive list of winners that includes defending NASCAR Sprint Cup Series Champion, Kevin Harvick. A feat, no other ThorSport Racing driver has accomplished since the series began racing at the 2.5-mile track in 2010. "I'll be making my debut at Pocono this weekend, so I don't know much about it other than it's a triangle. I've watched a few races from there already, and the thing I'm gathering from it is, it drives pretty much like a road course. It's three totally different corners, and you really can't drive it like an oval. It's definitely a mix breed between a road course and an oval." Chassis Chatter...The No. 13 ThorSport Racing team will unload chassis No. 53 for Saturday afternoon's Pocono Mountains 150. This particular chassis made its debut at Kentucky Speedway earlier this month finishing ninth. Pocono Possibilities...ThorSport Racing, Toyota, and Triad Racing Technologies are looking for their first wins at Pocono Raceway in the NCWTS. Previous Race Recap...Hayley started ninth in his dirt debut at Eldora Speedway and finished eighth, his fifth top-10 finish in 11 races this season. Track Details: 2.5-mile "Tricky Triangle"